As head bartender and Mixologist at Ninety Acres, Christina brings her signature fresh and local flair to her crafted cocktails. Born and raised in New Jersey and a former student at Seton Hall University, she worked her way through school in restaurants and fell in love with the industry. She realized hospitality was where she belonged and changed her major to business and hospitality management so she can get more familiar with what she knew she wanted to be involved in. Taking a few classes in the culinary arts she fell in love with mixing and molding flavors together. She has been in the industry ever since and worked her way up the ranks through a handful of restaurants. 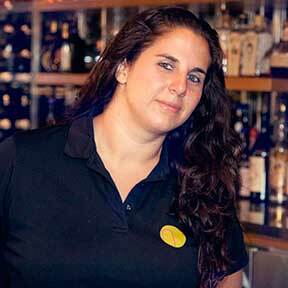 Now with over 10 years of experience in the industry and the bar, Christina is a staple in the Ninety Acres bar program. As head bartender she trains all of her staff, created a fantastic liquor list involving some heavy favorites, some great local small batch liquors, as well as rare limited products. She also creates new craft signature cocktails every season using only fresh, local and seasonal ingredients alongside her fellow bartenders. Everything at the bar is fresh and if Christina can make it, she will. From seasonal infusions and syrups to homemade bitters, even tonic. Along with all of that and the entire daily bartending grind, she also organizes spirit dinners and cocktail classes at the restaurant for the public to attend to throughout the year. She has made a name her herself in the local Jersey bar scene and has been in some press such as the Daily Record, New Jersey Monthly, and the Asbury Park Press where a handful of her cocktails have been noticed and featured. Christina’s passion and creative touch in the beverage industry along with some long hours and hard work throughout the years has driven her to where she is today.